The first of my ‘request beers’ was a Hefeweizen. No, it’s not an foreign word you’d say after a sneeze, it’s a German white beer. Similar in style to Hoegarden or Erdinger Weiss, this beer is unfiltered, cloudy with yeast and Wheat protein, and full of flavour creating esters which can give tastes of Bananas or even Cloves. A great idea for a hot sunny BBQ party! It is a very simple ingredient list this one as a lot of the flavour comes as a result of the temperature of the beer during fermentation. A higher temperature encourages more Banana flavours, a lower temperature brings on more of the Cloves. 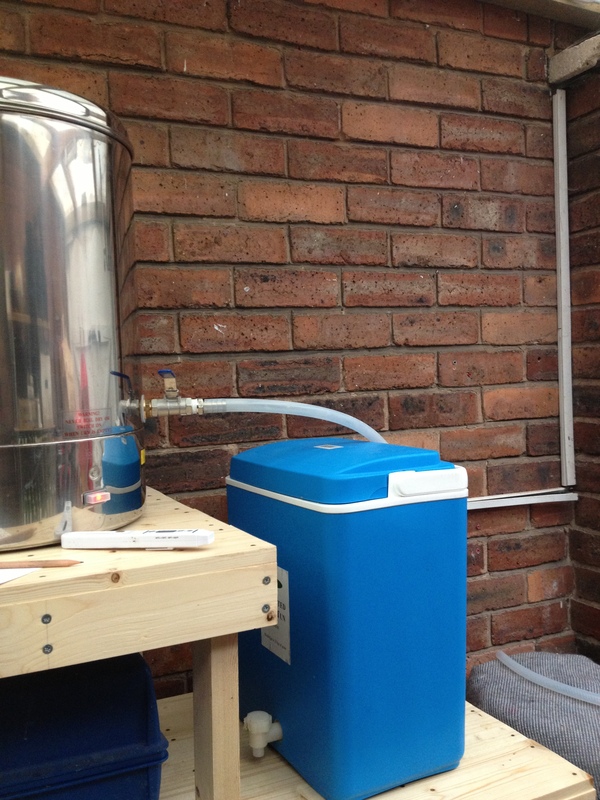 I decided with this batch to start high at 20C and after 7 days lower this slightly to 16C. Hopefully this would produce a balanced combination of both? The 25g of hops means that the Hefeweizen keeps a low bitterness to allow these esters to come through even more. 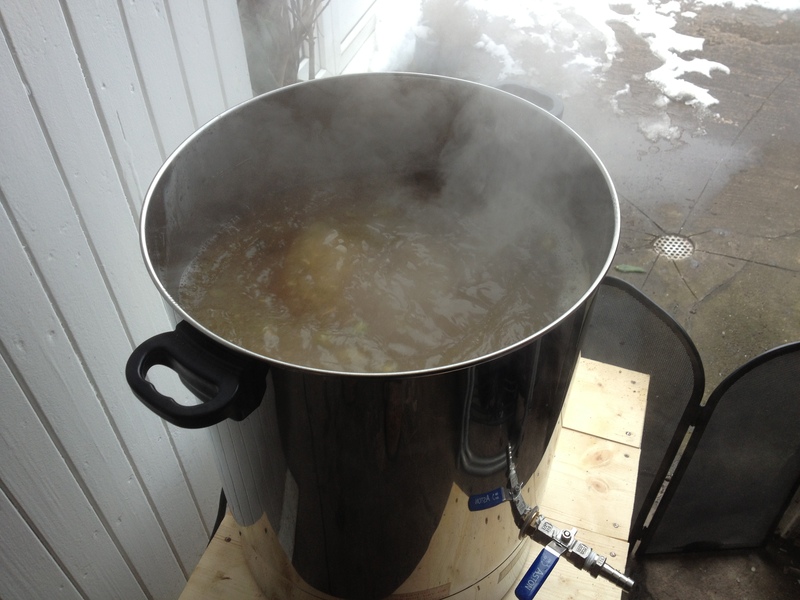 A good vigorous boil here, even with the cold weather outside. (Yes, that is snow on the drive on 27th March!) Unfortunately the boil was so vigorous the boiler actually overheated and cut out right on the 90 minutes mark due to a build up of caramelised wort on the base plate above the element. Nothing a good clean won’t fix though! There is no Irish Moss in this recipe, and all the practices that I have previously employed to get a clear beer are all unnecessary this time around. This really was a simple batch to make! 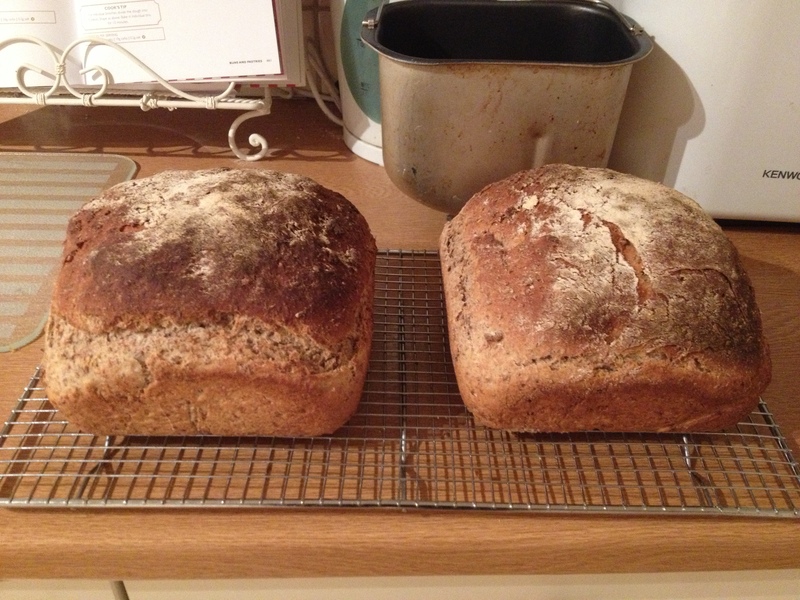 So much so I even found time to make a couple of loaves of Hefeweizen Bread with some of the spent grains! Both the OG and FG were pretty much on target with this batch coming out at 5.2% ABV. When it came to bottling time, I had a slight change of plan… 22 bottles of ‘normal’ Hefeweizen were filled from the FV as you would expect. The remaining 8.5 litres was drawn off into a sterilised bottling bucket and mixed with 4 teaspoons of concentrated Strawberry Extract. These 17 bottles of ‘Strawberry’ Hefeweizen won’t take on any red colouring as the extract was clear and colourless, however should have a definite extra fruity taste about them! Once primed, sealed and clearly marked, they were all moved indoors to condition. The Hefeweizen is a quick conditioning beer too which means we only have 4 days to go until tasting can commence. Cheers!